Cash Is King or Is It? If cash is king, why do we keep inventing new ways to pay for things? Mobile payments, debit cards and let’s not forget credit cards. There are a variety of credit cards such as cash back, rewards, charge cards, travel, affinity, low interest and airline to name just a few. A recent survey (Rasmussen Reports) indicates 43% of adults stopped using cash for a week. Is this the future? Which one are you? I almost never use cash! When I owned my restaurant, I always had cash. My customers paid cash for the food and it was convenient. Now the trend in quick service restaurants is to offer credit or debit payments as well as cash. Personally, I think it is a good trend because you can expand your business. Businesses should always make it convenient for customers to pay for your products or services. Everyone offers a variety of ways to pay for goods and services using credit/debit cards including your doctor! I do not use cash because it is inconvenient! I am paid monthly via direct deposit. In other words, it is cashless! I would have to go to the bank or ATM and withdraw cash. It just does not make sense to go to the bank so I can pay someone in cash. Although there are times when I must because that is what the business will only accept. I only use cash, if I get an additional discount. What do you do? Have we made cash inconvenient? A long time ago, I worked for a laundry company which owned coin operated washers and dryers. They owned a lot of them and that meant we made special arrangements with the bank to handle the coin. There were lots of procedures to make sure our collectors were honest and counting the money was a huge undertaking. Cash brings out the worst in people, you know. There are lots of businesses that require cash, but it is changing. In Los Angeles, the parking meters switched to credit or debit cards. Thanks to the recession, the fees have suddenly increased several fold! It went from a quarter for an hour to $1.25 an hour almost overnight! Cash strapped governments are looking for ways to increase revenue, so this is somewhat expected. Why are consumers moving away from cash? Is it inconvenience or are they just adding to personal debt? I wrote an article called Cash or Credit which discusses the choice. 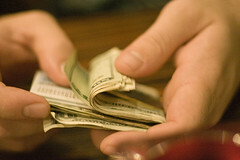 A 2011 study says that people who use cash think about the purchase more than the person that doesn’t. Personally, I am less conscious of my purchases when I use cash. I just know I used what I had whether it was a five, ten or twenty. When I use a credit card, I am much more conscious of not going over my monthly spending limit. I think I am more conscious of my spending because I pay my credit card balance every month. The future is here and I learned to adapt very well. I use a credit card all the time because I accumulate frequent flier miles. There are so many incentives to get credit cards and use them. I have a credit card (Costco) which rebates 3% for gas purchases and 1% of all other purchases, another credit card (Target) that rebates 5% immediately for purchases and still another (sears) rebates 1% of purchases as a discount on future purchases. Cash used to be king? It has taken more than forty (40) years since I studied about the cashless society to finally take hold. People will always use cash, but less! Where is the incentive for me or anyone to go the ATM to get cash? I would and have used cash when I can get a significant discount. Many of you use cash to control your spending, but recognize that is not the only way. At some point, you need to find other ways to control your spending. Cash is king, but you must adapt! I rarely ever use cash and actually spend more when I use cash. Credit cards, if used properly and paid in full every month, offer so many benefits over cash! I will pay cash if I can get a bigger discount than my cash back CC will give me though. I agree! I like the convenience of credit cards besides the frequent flier miles, cashback and discounts I may earn. Credit cards are advantageous when yo want to make a return too. Interesting! I went back to cash couple of years back – find it easier to control the ‘small’ and variable spending. It is only a bit of pocket money, food, the cleaner etc. The rest is direct debits that get regularly checked. I do think that now I’ll be OK with cards – I have learned how to spend. I gave up cash years ago because it is inconvenient! I find that if I have cash, I will spend. Just used a bunch of cash this weekend in Vegas! Other than that I hardly ever use cash. It is much easier to keep track of spending when I use my debit card. Did you use more cash because it was cash? I find that true when I use cash. It is one of the reasons, I try to avoid it. I am just like you! I hate using cash and almost never carry it…unless I get a discount for using cash, and if I have access to an ATM. Funny thing is…I pay an extra 35 cents to use my card at the cheap gas station. Maybe it’s a psychological thing but I should really start using cash to stop paying the 35 cents. There are other ways to avoid the fee. Find a station that is almost as low, but offers an oil company credit card with a 5% discount. I use Costco and get a 3% rebate. It’s more convenient and safe to use cards. Now why did I say safe? It’s simply because it’s too dangerous to bring (inside your wallet or pocket) with you a high amount of money especially when shopping for necessities. Why put yourself in danger if you could get what you want using the swipe method? Funny, I never really think about safety. I am very careful when I carry large amounts of money. Credit cards are convenient and safer because I can dispute charges and keep better track of my expenses. I actually use plastic. It is so much more convenient. I always pay it off in full every month so I never pay interest. I also track my spending so I stay on budget. To me both work but like you say, going to an ATM is often a pain. Plus is my wallet ever gets stolen I can just cancel a card. I am not out X dollars in cash. The worst part of losing your wallet is replacing the IDs! I try to only carry my wallet if I need to and just the credit cards I actually use. I’d rather use my credit cards for most purchases. Besides the rewards, you have better protection against fraud and it’s easier to keep tracking of your spending habits. With cash, I almost treat it like monopoly money. I love Monopoly! For me, it is just more convenient, particularly for returns. Don’t the studies show the people who use mainly cash spend less? I’d like to use cash more, but yes it is a hassle to get money out of the ATM. Maybe I should start a Home cash delivery service? That is true, but I tend to spend the cash in my pocket! I often thought of an ATM specific to change twenties. With a credit card I monitor my spending better. I think it is because I would manually have to add up cash receipts. I hate using cash–I know that it is harder to part with something you can see/touch but I’m horrid at keeping track of it. In my budget there are little question marks beside my cash withdrawals–parking? dry cleaner? snack at the bodega? who knows?! I agree keeping track of cash seems like too much effort. Also, I like the convenience of credit cards. Cash and debit cards – credit cards are the gateway to hell. Learned that one from experience. I think it is a matter of perspective. I have no trouble using credit cards and paying the full balance every month. I’m with you. Money on the card is “budget money.” Cash is “wow, time for ice cream.” I think I manage money well because I never carry cash. No spur of the moment decisions. I agree, although some people may say credit cards can be spur of the moment too. I rarely ever use cash any more because I love the rewards my credit card offers. I also find it the easiest way to track my spending. However, I don’t think cash is going anywhere because it is essential to the huge black market in illegal products and basic labour. This is a much larger part of the overall economy than most people think. I totally agree. There are a lot of cash businesses that exist in this economy. I put everything on the credit card, even my bi-monthly visit to Starbucks ($5.75). It all adds up to a lot of frequent flier miles. This is a very interesting question/observation. I see you were relying on your academic roots when writing this post. I’m with you on the convenience issue in particular. If you almost never get cash from your main sources of income, why would you carry cash except for a specific reason (i.e., a discount in your case)? That makes total sense. Thanks. I turned the circumstances into a way to control my spending. I rarely have any cash at all! I make all of my purchases on a rewards credit card. Doing it this way helps me earn rewards while also easily tracking my spending. I am the same way. I have accumulated enough frequent flier miles for my wife and I to travel first class to Europe. So far, I have earned enough rewards to get free tickets to Les Miserables and a new grill for my husband for Father’s day. It’s amazing how you can earn things for free just by spending your own money strategically. My wife and I usually take an overseas trip every other year. We generally fly business or first class. I like the idea of having some cash on my pocket, but I do have some problems, (no self control) when it comes to spend but with c/cards ,I’m very conciseness when it come to use them usually when I charge always pay in full at the time the bill arrives. I am with you! I used to spend any cash I had in my pocket. That was one of the reasons I carried very little cash. Now I don’t bother because it is inconvenient. I pay the entire credit card balance every month too. Cash is still king, but I do like putting many bills on the CC to get points, as long as I can pay it off before interest is due. I never use debit though — either cash or the CC. The exception will be a place that doesn’t accept credit and I don’t have the cash on me. I never use a debit card. I rely totally on my credit card and use cash when I have to. Occasionally, I get a cash discount when I use cash. I try to use as little cash as possible, however, now that I’m transitioning into a new life without a day job income, I’m going to be using more cash and a debit card to be MORE strict. You are going against the trend, but that does not make it wrong! The nice thing about credit cards is you have a record of your purchases. I have to say, I think this whole post is based on a misunderstanding of the phrase. The phrase “Cash Is King” has little to do with payment method and everything to do with currency. A credit card is still equivalent to cash, just electronic rather than tactile. The issue of cash being king is more about the ability to use different amounts of cash for different things; you wouldn’t want to be paid for your work with a mirror, which you then take to the grocery store to trade with someone who needs that mirror for food that you need (i.e. barter). So the easiest way to facilitate trade is to come up with a fiat system, i.e. cash, which can be assigned a value, then use that agreed upon value to negotiate trade for multiple things. Sorry, don’t mean to be critical, but I think it’s a pretty important distinction to make. Perhaps you are taking it too literally. Use of cash is changing and people are using alternative means to purchase products or services. They are debit, credit and prepaid cards versus cash. In addition there newwer methods of payment such as electronic payments. The future will be much less use of cash and much more alternative payments.